By Myprotein Writer Rawad Hamzi, M.S., B.S. Following the holiday season, after the over-indulgent meals and plentiful downtime spent with family and friends, many of us go through a period of self-reflection on our lives and decide how we want to improve ourselves moving into the New Year. For most people, these goals invariably include resolutions about eating more healthfully and exercising more frequently – I believe it’s both a blessing and a curse that we go through this process annually. On the one hand, the fact that you are motivated to set self-improvement goals defines your drive to achieve them. Conversely, setting up substantial goals for the entire year at once can quickly prove overwhelming, and falling off the wagon for a few years in a row can even set up a self-defeating psychological barrier to maintaining change in successive years. …But why do most people fail to accomplish their New Year’s resolutions? Why are most of the newcomers at the gym, for the most part, long gone by February 1st? A better question still: how can you convert your short-term modifications to lasting changes that will carry you to your goals throughout the entire year and beyond? It’s one that few of us would actually consciously believe or defend if we were to reason it out, but one that appeals to man’s most innate trait: laziness. The myth is that true, lasting change doesn’t have to be strenuous or take much time commitment. Our society is obsessed with the immediate gratification paradigm: we want results immediately and with minimal effort, and we are deluded by clever marketing and deceptive reporting to believe that with a “simple trick,” we can easily accomplish the changes we want in no time at all. From fad diets to herbal supplement pills of every color, shape, and promised result imaginable, the profit of tricking people by appealing to their laziness has been marketed and widely exploited. Elite performers in any field often make their success appear effortless, but the work they’ve put in to achieve their level of proficiency is the only real “secret” that goes unmentioned. The piano virtuoso playing beautifully on stage does not make evident the thousands of practice hours she has dedicated to attaining excellence, just as the fitness model posing on the cover of a magazine (albeit probably touched up by Photoshop) does not bring to mind the mental discipline he demonstrates in meal planning and remaining consistent in his workout routine to maintain the physique he has earned. We see experts in any field and are so astounded by their apparent skill and success that we never think to focus on the true feat: the dedication to lasting change they made and stuck to on their trajectory to greatness. I’m here to tell you that you already have the required characteristics to put yourself on a similar trajectory; we just have to discuss the logistics. Let me be absolutely clear: true change requires hard work and dedication. The very fact that you’re reading this article demonstrates that you have, at the very least, the motivation to set yourself on a path to improvement. However, most people do not fall short of their goals for lack of motivation or desire for self-improvement. When is the last time you talked to someone who didn’t genuinely want to look and feel their best? Most New Year’s resolutions fail because people don’t realize that such significant change, and even the planning thereof, must be done in small increments, slowly and deliberately, to be successful. Setting a goal of developing six-pack abs, a 500 lb deadlift, or switching to a paleo diet if you think you aren’t eating healthy foods is unrealistic if you’re starting out with a moderately high body fat percentage, currently lift substantially less than that, or don’t cook much to begin with, respectively. Make no mistake, I firmly believe in setting extreme long-term goals (for instance, I myself hope to compete in my first bodybuilding competition at a body fat of 4%). But I advocate putting most of your focus and energy towards setting and accomplishing smaller, more readily achievable goals as benchmarks between you and the desired end result. It’s not the fact that people want drastic results that sets them up for failure, but rather their lack of smaller interim goals on the w ay to their desired outcome (or occasionally, their unrealistic expectations regarding the timeframe). They lose sight of the small progress they make each day in the vastness of how far they still have to go and become overwhelmed. If you remain fixated on the finish line from the starting gate, even if it motivates you fiercely at first, all you’ll be able to see as time goes on is how far you are from reaching it. Let me give you some tips for better techniques for reaching your goals that take advantage of the motivation and determination you already have. The first thing to do is sit down with the old-fashioned pen and paper (I’m a firm believer that this antiquity makes what you write more genuine) and reflect on what you want to improve in your life. For my clients, I typically suggest making a list of just three major modifications to start with, and only adding more as steady progress has been established on your primary three. For example, one client listed quitting smoking, losing 30 lbs, and eating home healthy meals at least half of the time as his three – In my opinion, these are excellent, realistic goals that will unquestionably improve his health. Today, with three solid months of progress since setting these goals, he is currently a nonsmoker, has lost 15 lbs, and is cooking far more than he did previously. A side note – if you’re a smoker, even an infrequent one, I urge you to at least consider making tobacco cessation one of your first goals, as there is practically no area of your health that won’t benefit: you’ll lower your risk for the number one killer in the US, heart disease1, reverse insulin resistance, the disease process that causes diabetes and contributes to obesity2, reduce the amount of fat carried around your mid-section3, and increase your overall quality of life4, to name just a few. along with a fitness goal, as the combination is much more powerful than either one alone, but choose an eating modification that you can realistically achieve, such as cutting out dessert, or eating vegetables with every meal. Under each of these three goals, write five to ten interim goals broken up into two week blocks. These need to be rather specific so you can keep yourself accountable. For example, if you aim to cut dessert from your diet, your first two months of interim goals could be: having dessert only three or four times per week for the first two weeks, then twice per week for the second two, then once per week for the third two weeks, and finally, substituting a small protein shake at night instead of dessert for the final two weeks. If your goal is to lose 20 lbs, you should make interim goals of keeping a daily food journal (which by itself has been shown to increase extent and maintenance of weight loss5), exercising at least twice per week for the first two weeks, then three times per week for the second two weeks, and so on. The more specific you make your goals (however small they need to be), the more accountable you can be, and the more you’ll be able to track – and be inspired by – your successes. 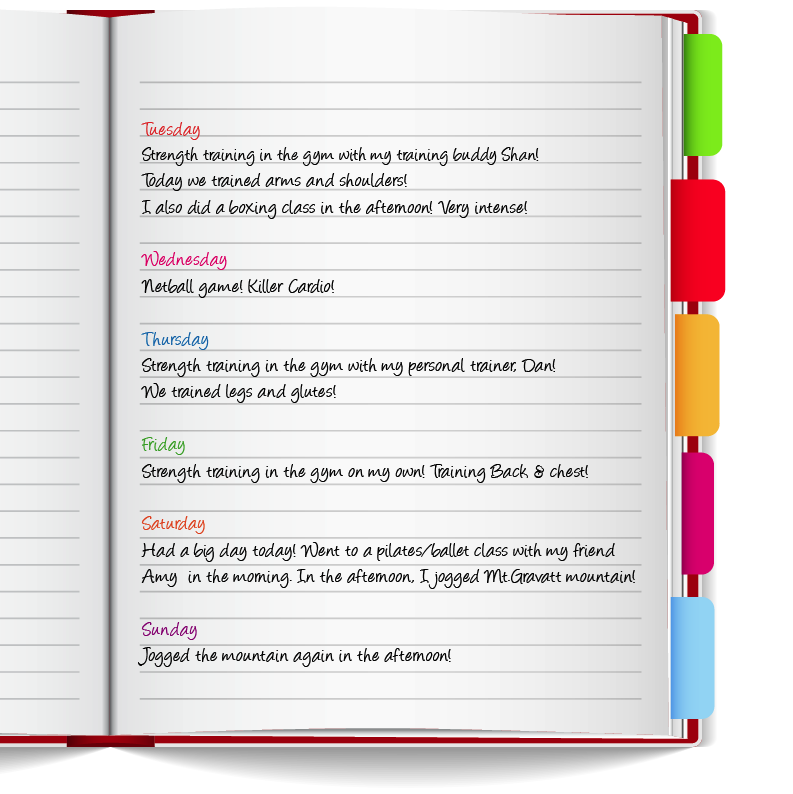 Keep a log of your interim goals in a visible location so you’ll be more liable to stick to them. 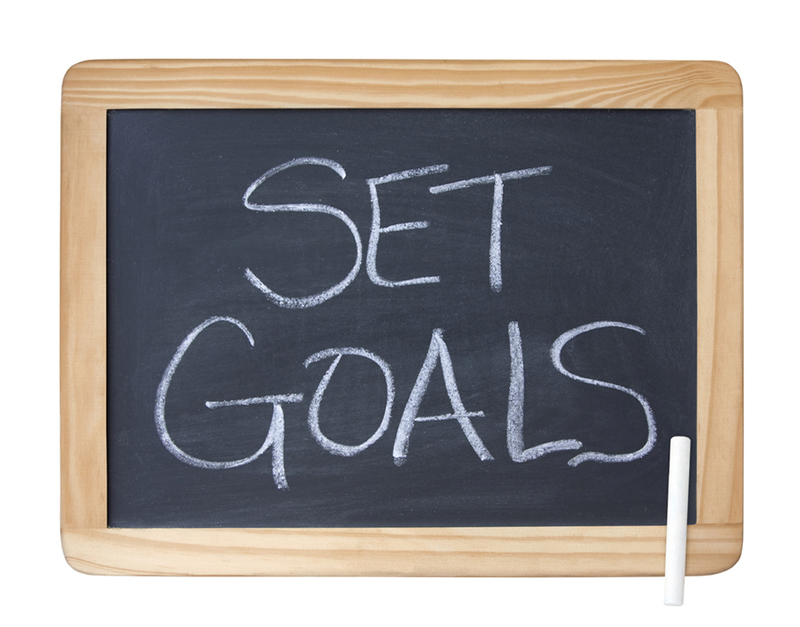 I’ll tackle forming targeted interim goals more in a future article, but the important thing is that you simply start. In addition to keeping a log of what you’re supposed to be doing in a highly visible area, make checkmarks on a calendar each day for the weekly interim goals you met and mark X’s for those you didn’t. Don’t beat yourself up about falling off the wagon for one day or even a few! 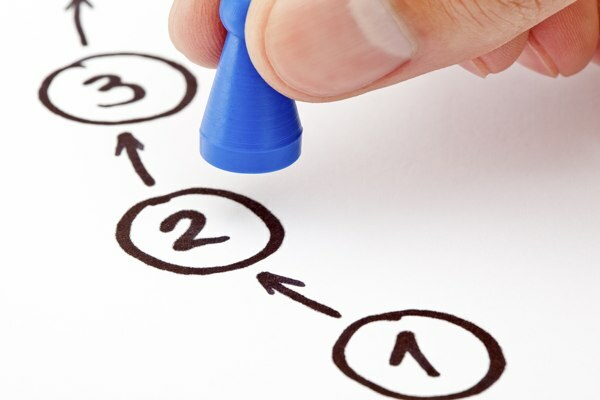 If you do notice yourself missing one of your interim goals for more than two to three consecutive days, you may need to adjust them to smaller, more manageable tasks that you can confidently achieve before advancing. This entire process is a give-and-take, and you should reflect on your interim goals every week to tone them up or down according to your progress. Dwell on your successes just as much as your failures and realize that lifestyle changes are among the most difficult to make; the fact that you remain on the path to self-improvement is impressive by itself. The key to unlocking long-term success is to keep chipping away at your goals day after day, week after week. If you’ve established realistic interim goals, you should be able to see yourself slowly but surely making changes in the right direction; use the emotional response from your progress to fuel your continued efforts and you will amaze yourself with how drastically you can modify your health. The point of consistency is to establish healthy behaviors through repetition. Habit formation is governed by the same addiction and reward pathways of the brain that mediate tobacco addiction or unhealthy eating patterns, for example. Sticking to your interim goals allows you to recruit these neuronal pathways to reinforce healthy habits yet receive a similar reward. In this way, it is helpful to keep track of your progress in a variety of ways (progress pictures and weight measurements are just two) and take pride in your changes, however small they may be. After two weeks of going to the gym religiously, it becomes less of a chore and more of a reinforced behavior; it becomes your ne w “normal”. Once you make it past the sticking point of converting a new action to a habitual behavior, your body adjusts to expect it. I have known some runners, for example, who experience an increase in their heart rate simply by tying their shoes prior to a run. In addition, the release of endorphins induced by physical activity elevates mood and reinforces adherence to fitness regimens6, which becomes a more significant source of positive feedback once you have changed exercise from a new behavior to a healthy habit. Just get yourself to the gym consistently; your body will learn to expect it! To ease the transition and make exercise maintenance more likely, try to make your gym routine fun in any way possible. For example, I’m not much of a fan of s teady-state cardio, so I stick to fast-paced, engaging High Intensity Interval Training (HIIT) routines that both let me get through my cardio faster and have more fun, with activities such as jump rope, tire flips, and kettlebell swings. The host of other advantages HIIT boasts over steady-state cardio deserves an article of its own, which I plan on writing soon. For clients who hate leg day, for example, I’ll engage them in contests to compare squat weight relative to body weight and cook a healthy treat for whoever progressed the most in one month. Other people I advise to alternate an activity they don’t enjoy with one they do in a super-set or circuit to encourage them to get through it. My point is that you have to find what is most engaging and fun about exercise to you and figure out a way to incorporate and maximize that aspect in your routine. I have always heard that the best workout is the one you will consistently do, and I absolutely agree. Making positive changes to your health is a serious and important task, but by all means, have fun with it! I have covered just a few major points that I believe are essential to planning and maintaining lifestyle changes. The bottom line, which I cannot emphasize enough, is that achieving your goals relies on your ability to make small interim changes, track your progress, modify your goals as you move forward, and find enjoyment in the whole process. Look out for articles in the near future with more tips and techniques for various topics in health, nutrition, and fitness. 1: Critchley JA, Capewell S. Mortality risk reduction associated with smoking cessation in patients with coronary heart disease: a systematic review. Journal of the American Medical Association. 2003; 290(1): 86-97. 2: Eliasson B, Attvall S, Taskinin MR, Smith U. Smoking cessation improves insulin sensitivity in healthy middle-aged men. European Journal of Clinical Investigation. 1997; 27(5): 450-456. 3: Barrett-Connor E, Khaw KT. Cigarette smoking and increased central adiposity. Annals of Internal Medicine. 1989; 111(10): 783-787. 4: Mulder I, Tijhuis M, Smit HA, Kromhout D. Smoking cessation and quality of life: the effect of amount of smoking and time since quitting. Preventative Medicine. 2001; 33(6): 653-660. 5: Kruger J, Blanck HM, Gillespie C. Dietary and physical activity behaviors among adults successful at weight loss maintenance. International Journal of Behavioral Nutrition and Physical Activity. 2006; 3(17). 6: Schwarz L, Kindermann W. Changes in beta-endorphin levels in response to aerobic and anaerobic exercise. Sports Medicine. 1992; 13(1): 25-36.